A response to Scouts Canada Human Resources Chief and Chief Spokesperson - SCOUT eh! The memo dated 21 November 2007, circulated by Mr. Bill Palamar, makes a scurrilous allegation that SSCOUT eh! has "deliberately generated public concern through misinformation." The fact is that the information that was used to come to the conclusions in our Crossroads reports is public information stated in the Financial Statements of The Boy Scouts of Canada National Operation for the years end August 31, 2002 to 2006 inclusive. Those Financial Statements were provided by Scouts Canada on request by myself and Joseph Grittani. If there is any "misinformation" it only arises from sensational headlines and from the take that the press had on the "story". One of the press stories used the word "bankruptcy" encased in brackets. SCOUT eh! has never suggested that Scouts Canada is bankrupt, this is nothing more than a press gloss to sensationalize the issues. 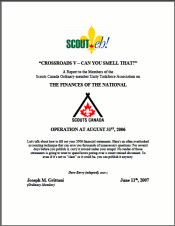 It is stated in the Financial Statements for the years ended 2002 and 2003 that "There is significant doubt about the appropriateness of the use of the going concern assumption..." This note was dropped in subsequent years despite the fact that in the year ended 2004 Scouts Canada was required to borrow $1.814 million to maintain the ongoing operations and increased that amount to $1.956 million for the year ended 2005. Note 4 to the Financial Statement for the year end, August 31 2006, sets out the explanation of the Employee Future Benefits. Nothing in that official document prepared for the Scouts Canada National Operation and signed by the Vice Chair of Finance and by the CEO says anything about the valuation issues alluded to in the memo of Mr. Palamar. According to the Financial Statement the Federal regulations require that "...plans must meet certain solvency requirements..." and goes on to say, "The actuarial valuation performed as at January 1, 2006 reported a solvency deficit of $946 thousand and a going concern deficit of $701 thousand". The note further discloses that the total pension and other obligations are $28.948 million while the assets at fair value are $21.849 million so that the obligations exceed the assets by the amount of approximately $7.1 million. The assertion that Scouts Canada had a surplus last year is an assertion based on the careful use of the accounting rules applied in a manner that would satisfy that result. The analysis, in our view, does not present fairly the financial position of Scouts Canada. The analysis provided by Scouter Joseph Grittani, C.A., in our view, better represents the financial situation of Scouts Canada. That report carefully analyses the assumptions. That report and every previous report held open the invitation for comment and the promise of correction if anything contained therein was incorrect. The real question is whether, given the current level of youth registration, the organization can continue on the path that it is currently following. 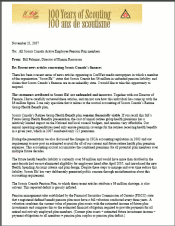 Mr. Palamar's comments in his memo are inflammatory and do not contribute to a rational assessment of where Scouts Canada stands from a financial point of view nor whether the current level of expenditure is maintainable. SCOUT eh! has never asserted that Scouts Canada is going bankrupt. What we have said and what we continue to believe is that the current level of expenditure cannot be maintained on an on going basis and that serious measures must be adopted to reform Scouts Canada so that it can remain viable. This information has been on our website since early in 2005. Our position is not news. Why the media pick up on some item is a mystery. No one from Scouts Canada has challenged anything that has been posted despite the clear invitation to do so. The information has been posted in the public domain for two and a half years. We would reiterate that the information is all contained in the Scouts Canada Financial Statements and all figures used in Scouter Joseph's analysis were provided to him (such as they were) by Scouts Canada. They are Scouts Canada's figures from no source other than the official approved financial statements of the National Operation, and include commentary and information asserted in notes to those statements. We didn't make them up. If, as Susan Mackie has asserted, the figures are ridiculous, she should consider the fundamental source. Our Scouts Canada organization has had to deal with the press on a number of sensitive issues. Susan Mackie and others in authority should know, much better than we, that the press likes the sensational take on things. SCOUT eh! is being used by our National Organization as a convenient scapegoat to avoid having to answer real and serious questions about the presentation of Scouts Canada's financial position as asserted in the Annual Financial Statements of the National Operation. "Blame SCOUT eh!" is a rather pathetic response to real issues that face our organization. Mr. Palamar should apologize for his intemperate and unjustified remarks. The volunteers should not be subjected to diatribes or abuse from staff members whose conflict of interest in patently obvious. Except for the opportunity to speak at the 2004 AGM granted to me by our then Chief Commissioner, Mike Scott, we have not had any open forum in which to question anything. The members of Scouts Canada, and particularly the ordinary members who belong to SCOUT eh!, would much rather be allowed the opportunity to ask questions at an AGM where we could confidently expect concise and realistic answers. We would rather build the image and reputation of Scouting as per our own SCOUT eh! constitution rather than debate issues in the media.